On the road. 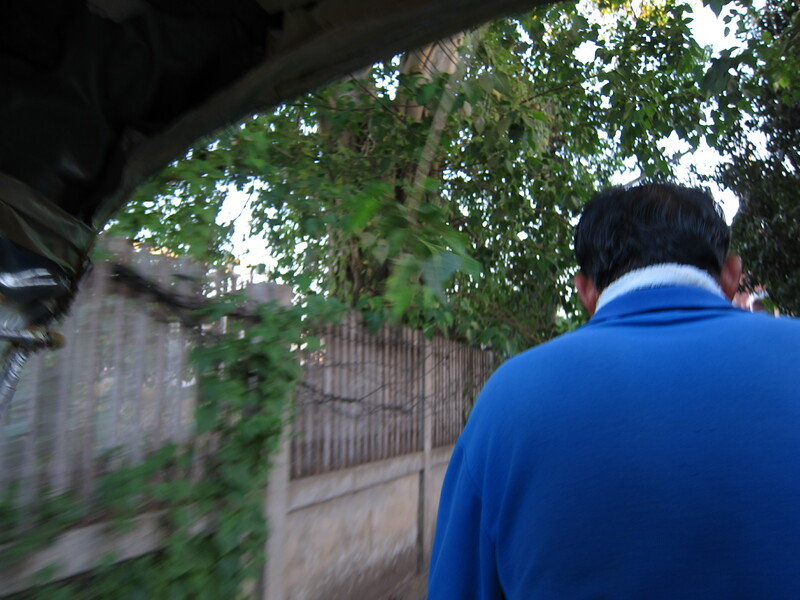 View from cycle rickshaw. There were few tourists in Phitsanoluk, where I stayed for one night en route to Mae Sot. I had my meals at the restaurant in my hotel, where they had an English menu, which the other restaurants nearby did not have. Like in Phrae, people in Phitsanoluk spoke minimal English. Yesterday I arrived in Mae Sot, Thailand, near the border with Myanmar. As I got off the bus I was met by a man with a friendly, weathered face with skin as brown as mine and a big smile speckled with silver teeth. He asked where I was going, and I told him the name of my hotel, which he said he knew, and he offered to take me there in his cycle rickshaw. I hesitated for a moment as I was not used to the idea of someone physically exerting himself to transport me, especially for the low price he was asking; but I quickly reminded myself that this was his livelihood and that I would be helping him make his living. He cheerfully and efficiently conveyed me to my hotel. I thanked him with the few words in Thai that I knew, saying “kup kun krub,” and gave him a generous tip. I asked if he was from Myanmar (as I had suspected when I first saw him) and he confirmed he was. From my research about Mae Sot I learned that there were many people from Myanmar here, some working with legalized status, others working without documentation, and others having arrived as political refugees. Sadly, Mae Sot is also a destination and transit point for human trafficking. Many international NGOs have a strong presence here because of these social and human rights issues. So despite having few merits as a tourist destination per se, there were a large number of foreigners here, mainly long-term NGO workers, or tourists like me who were planning to cross the border into Myanmar. 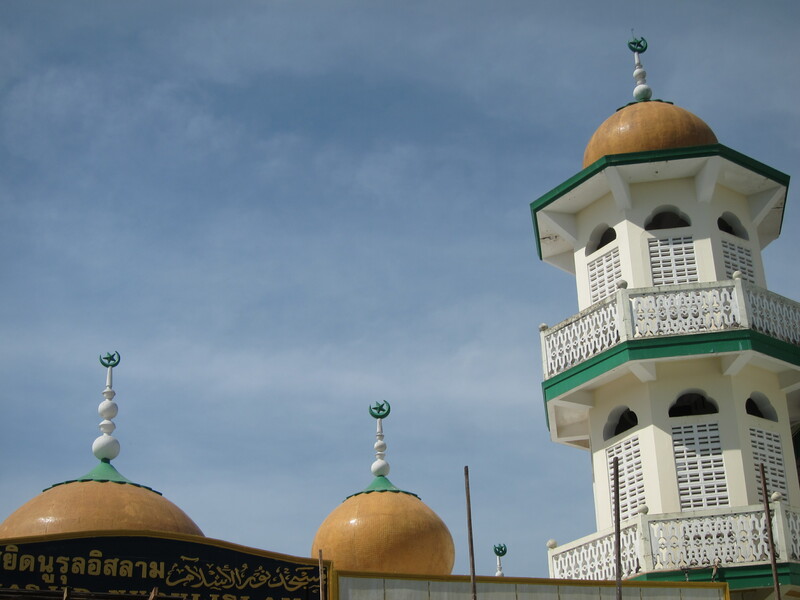 Mosque in Mae Sot. Many of the Muslims in Mae Sot are ethnic Rohingya refugees from Myanmar. 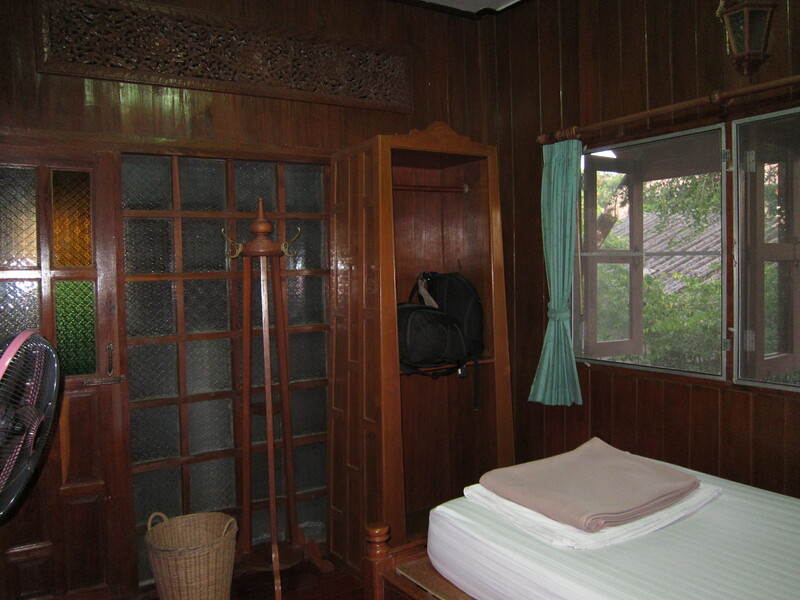 My teak-paneled room at the Ban Thai Guest House in Mae Sot, Thailand.